“The search began with the unfurling of an Ordnance Survey map. A crackle of crisp paper and the scent of knowledge flooded the senses. The sight of a vast, miniature world settling on the living-room carpet. Such graceful grid squares of order and logic. There’s an intrinsic magic about the curves and contours of your local area being condensed into a two-dimensional illustration. A childhood fascination of mine. It needed habitats and as many as possible in one place, for surely this would bring more variety in bird species? “The new year rolled in and on its second day came the inaugural patch ramble. It was a cold, crisp morning with every exhalation billowing like pipe smoke. The shrubbery on the approach to the lake glistened with a diamante frosting. The icy avenue was still and quiet – a stark paradox to the clamour of Christmas and New Year. A clean slate – the records for the day make for interesting reading. A wider range of birds were observed and accurate counts reflect a thorough and focused walk round. A Little Egret was the undoubted highlight; now beholding an almost mythical status at the patch – with no more than one or two seen each year. Another January surprise came the following weekend in the form of a fine water-bird – a Goosander. It was the first bird seen that morning, darting purposefully across the ornamental lake. This Drake, with his bottle-green head and clean white body, was a joy to behold. A hunched and vaguely reptilian bird, armed with a saw-like bill; the origin of their collective family name – the sawbills. Goosanders’ can turn up on any inland body of water during winter, but there, so soon after getting to know the place, felt like it carried more significance. You can support the publication of my book, Bird Therapy, by contributing to the crowdfunding campaign here. 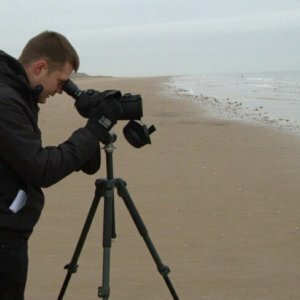 Although Bird Therapy is now 100% funded and will be published, if you would still like to your name in print as a supporter of an important book and message, then the crowdfund will still be open to pledges for a few more months yet.